Nutrition! Calorie Intake! Body Condition! Oh my! This lab is not heavy because of muscle..actually has significant loss of muscle over the hips. But too heavy everywhere else. Not healthy, folks. This poor dog hurts. This stuff is SO important, guys. We saw another handful of pets today (not going to name names) who were carrying some extra pounds and my joints just groaned for them. Please read this great bit courtesy of Ohio State University. Pets’ energy (Calorie) needs to maintain a healthy weight for their life stage depends upon several factors. First, the energy to perform essential body functions like digestion, respiration, heart functions, brain functions, etc. 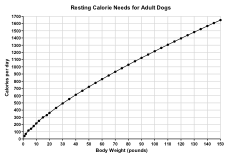 (Resting Energy Requirements or RER), which can be calculated by multiplying the animal’s body weight in kilograms raised to the ¾ power by 70, for example, a 10kg (22lb) adult neutered dog of healthy weight needs RER = 70(10kg)3/4 ≈ 400 Calories/day. 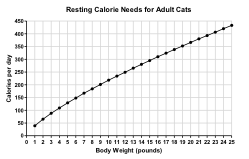 One also can use the charts below to estimate resting calorie needs. The RER is then multiplied by factors to estimate the pet’s total daily energy needs. (See Table 1). Individual pet needs can vary by as much as 50% from calculated values however, so these are only starting points for estimating the amount of food to be provided daily. The amount is then adjusted up or down as needed to maintain a healthy body condition score. Table 1. Known life stages and corresponding factors used to estimate daily energy needs for dogs. As mentioned, these calculations can only give crude, “zip-code” level estimates of your pet’s Calorie needs (and so how much to feed), which can change with time and circumstances. For example, some dog breeds also require more or less energy by the inherent nature of their breed. For example, an active Jack Russell Terrier versus a miniature poodle. Although both are about the same size, the highly active nature of the Jack Russell Terrier compared to the slower pace of the miniature poodle can result in very different energy intakes to maintain a healthy body condition. 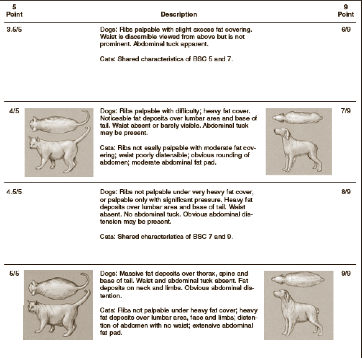 Veterinarians also use Muscle Condition Scoring to determine your pet’s health. The muscle condition score also helps estimate whether or not the pet is receiving enough protein. In healthy pets, coat and skin quality also can be affected by the amount of protein (and a number of other nutrients) consumed. Animals use protein as a source of the amino acids they cannot make, and of nitrogen for the ones they can make. As long as the diet has the proper balance of available amino acids, whether they come from plant or animal sources does not make any difference to the nutritional health of the pet. Although energy requirements vary greatly, protein needs are fairly constant, with adult dogs generally needing at least 1 gram per pound, and adult cats at least 2 grams per pound. Younger and geriatric pets may need more; young pets for growth, and old pets because they appear to be less able to utilize dietary protein than are younger animals. Within reason, more protein is not generally dangerous, but may be wasteful. 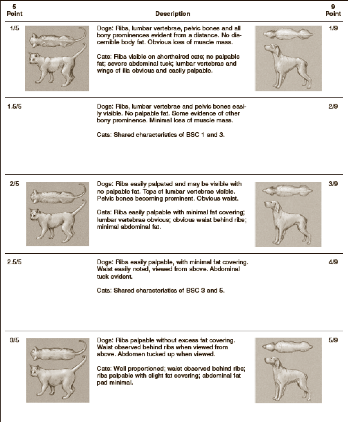 While pets with a healthy muscle condition score, coat and skin quality are probably getting all the protein (and other nutrients) they need, problems with these body systems can be due to a wide variety of nutritional and non-nutritional problems, which can be diagnosed by a veterinarian.